Windows Vista has a demanding system requirements and specifications, where you need to have at least 512 MB of physical memory with recommendation on 1GB RAM in order to fully enjoy Windows Vista especially Aero Glass experience. However, you may have old PC with little memory that needs an operating system, or you need to try out Windows Vista on your spare laptop or desktop machine that has only 256MB memory. 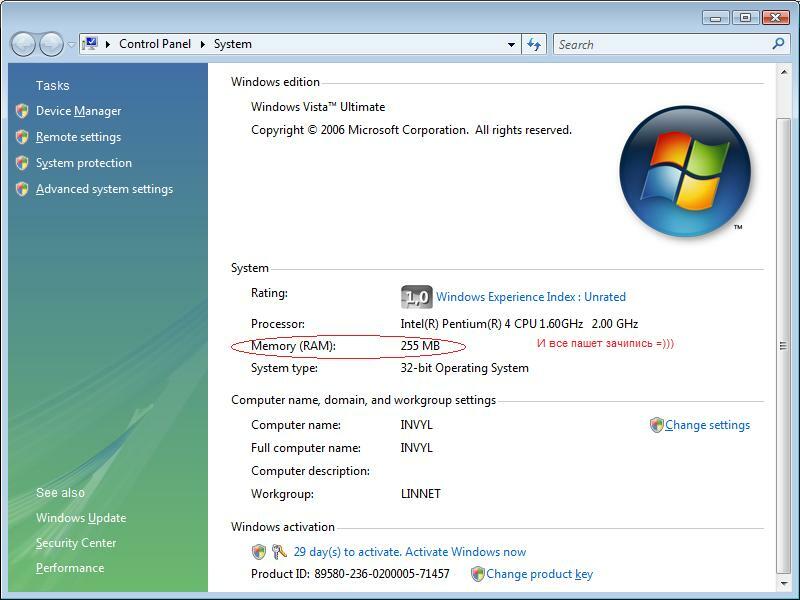 Windows Vista will start complaining about low memory available and stop the installation if you have less than 512MB RAM, here a patch that hacks and takes away memory check by Vista. Download the patch vista_nomem.exe (no longer available). Some anti virus has detected the file as virus or Trojan heuristically, so use at your own risk. The vista_nomem.exe cracks winsetup.dll file so that the Vista setup allows Windows Vista to install on PC with just 256 MB of memory. However, to apply to patch, you won’t be able to install Windows Vista by booting from a Windows Vista DVD or ISO image. So you’ll have to copy the Vista setup files to hard disk and patch the file, preferably on the target machine that you want to install Windows Vista on, and then execute the Vista installation on hard disk from another working copy of Windows or via WindowsXPe. Copy the whole distribution of Windows Vista DVD to the hard disk and place them in a directory (folder), for example in C:\VISTADISTR\. Copy the vista_nomem.exe to the folder (i.e. C:\VISTADISTR\). Make sure that winsetup.dll is located on the same folder. In the Da Patcher by AiFiLTr0 window, click on Crack button. A Choose File “winsetup.dll” dialog will appear. Navigate to the Vista setup files folder (i.e. C:\VISTADISTR\) and select winsetup.dll. Start installing Windows Vista by executing C:\VISTADISTR\sources\setup.exe file. 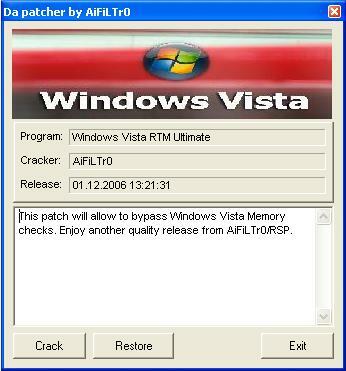 AiFiLTr0 successfully runs Windows Vista on machine on just 256MB. Note that Windows Vista requires a minimum of 10GB or HDD space, and if you still want your existing Windows installation on the machine, make sure you have partition the hard disk for Vista in order not to mess up the current Windows such as WinXP installation. Beside, you will need to turn off unneeded services (you can forget about Aero Glass feature, no need to try to turn if off, it will be disabled by default on 256MB system) and other unnecessary extras so that the Windows Vista will run smoothly and without lagging on the 256-MB system.